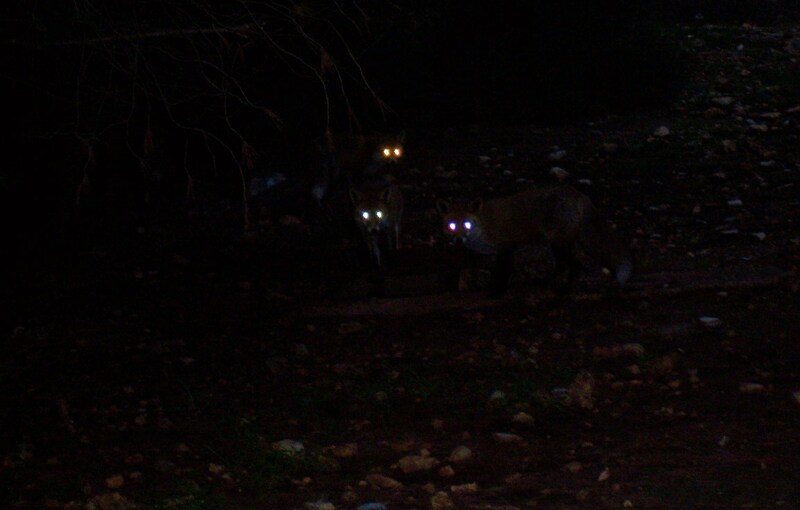 Nighttime awaiting their dinner…..I really love those pairs of phosphorescent luminous eyes…. they seem harmless,but are they really? ?i think that u gain their love and confidence..u should be really proud that u have developed this relationship with them.. Absolutely harmless and innocent.I have to admit that it’s really fascinating and a very,very special experience . You know my animal love ,my incurable passion for animals but I could never ever have imagined that one day I would be attentive to foxes.It’s not that I simply watch them. They come near me when I serve their supper and most of them start eating before I finish with the serving.You also know very well that a couple of them grab food off my hand .It’s unbelievable. Let alone the instance, which I don’t want to touch in detail ,when one of them jumped into our garden or when another one used to follow me and our dog while we were enjoying our evening walk. (S)He even copied the dog’s impulse moves…. I am sorry ,I am so sorry but I have to stop here ,I won’t tell anything else , for, people will start thinking it is simply my imagination which went beyond the normal limits…..
You are one of those who know very well that what I say it’s the plain truth .I am sure you remember when once you and Anastasia came over with me to the feeding place . How wonderful ! It was a balmy summer night. Enough of my ramblings …When I start talking about them there is no end….sorry.